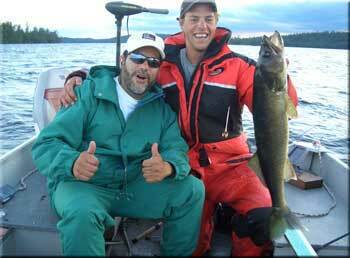 The information on this page is an overview of fishing on the main lake (Lady Evelyn Lake). For info on the other lakes we use click here. To view the wildlife gallery click here. This is one of the last, large lakes in Northeastern Ontario that is still classified as being remote, mainly due to the dam at the north end and absolutely NO ROAD ACCESS. It covers an area roughly 22,000 acres in size when added to Sucker Gut (funny name, beautiful lake) and Willow Island Lakes. Upwards of 450 miles of wilderness shoreline for walleye to cruise, bass to nest and northern pike to ambush. Red Pine is located on the Northeast arm of the lake featuring many sheltered fishing areas and water depths in the 15' to 40' range. No need to hunt for trophies in deep water here. In fact, as large as Lady Evelyn Lake is, most guests stay within a three mile radius of Red Pine Island for most of their fishing excursions! 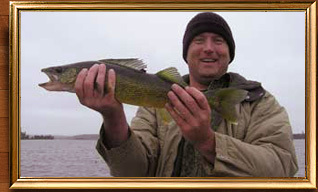 This is the time of year we see some very large Walleye and Northern Pike. Also a good time to visit if you like any of the Trout we have in portage lakes. 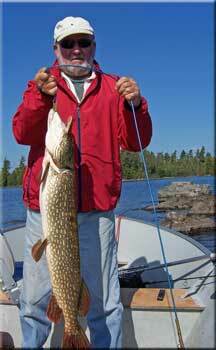 Trolling or drifting the rocky points for Walleye and shallow northern bays for the Pike. BAITS - Minnow Rigs, Rapalas, Hot-N-Tots for Walleye; Large Spinners, Silver Spoons, Rapalas and Little Cleos for Pike. The Walleye are found in the main part of the lake feeding on the sandy shoals especially in the early mornings and just before dusk. They can easily be taken on live bait like worm harnesses or jigs. Generally a slow-as-you-go presentation is the rule. Those "Crazy Northerns" (we're still talking fish, here), want those spoons like the old Red & White Dardevles and Perch Rapalas. Find them ready to ambush a meal (or in this case, a tricky piece of hardware sporting a hook), along the weedlines in 7 to 10 feet of water. 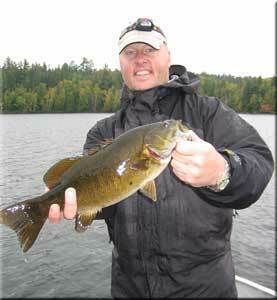 The Smallmouth Bass action turns on when the water warms. These fiesty critters hang tight to the rocky ledges about two fathoms (12 feet) down. They prefer small jigs with worms as appetizers or maybe a meal of Mepps! 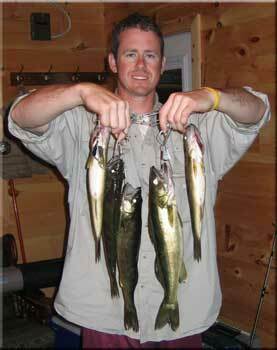 Lots of "shoreluncher" (14" to 19") Walleye caught at this time of year. Stay shallow (4' to 8') with perch coloured Rapalas, and light live bait rigs or go deep (40'+) with chartreuse jigs and minnows. Northerns turn on to flashy spoons or Orange or Blue Jointed Rapalas. Grrrreat topwater action for rod bustin' Smallmouth Bass as the water cools. Use Hula-Poppers and Torpedoes (the non-nuclear variety, please). "Lions & Tigers and Bears, oh my..."
Previous owners James and Janice who bought the lodge over 25 years ago, and their guests have seen some amazing interactions amongst the animals that have a home in the North. From a crazy Loon that hung around our guide boat all last season just waiting for someone to catch a fish so he could grab it, to seeing our family cat, Bugsy, nose to nose with a skunk. (From a distance it was hard to tell who was who!) The stories of wildlife encounters are shared nightly in the dining hall. Without skyscrapers, the only thing to get in the way of seeing the the flight of a bald eagle, golden eagle or great blue heron might be the towering red or white pine trees. See a few of the wild animals in our gallery. COPYRIGHT 2008-2018 © RED PINE WILDERNESS LODGE. ALL RIGHTS RESERVED.